We all know that drinking more water is good for us, helping to flush out the body of the toxins, oxidants and other day to day impurities that build up over time. The main obstacle to drinking more water is, for a lot of people, that tap water tastes bad due to the chlorine used in it by water companies. Tap water varies wildly in quality and taste depending on where you live. In the South, the water is generally hard and will have a flat or bland taste its ‘neutral’ character. Whichever water you prefer, Total Soft Water can give you that – straight from your own tap. We are often asked “what is the best type of drinking water filter?”. Well, not all filters do the same thing. Depending on your tastes and preferences, one water filter might be more suitable than another. That’s why we have all of our water filters “on tap” in our showrooms for you to come and try before you buy. These use a cartridge or carbon filters. The carbon is usually carbonised coconut shell, which has a porous structure that filters out sediment and removes chlorine. Activated carbon is used a lot by the municipal water treatment industry as it is an effective way to process clean water. However, carbon filters alone do not remove limescale. These filters generally contain some carbon too, but they are also more capable of fighting limescale. Some filters, such as the Kinetico AquaScale or the Brita P1000, are able to remove the limescale forming material – as well as traces of heavy metals, such as lead and copper. The downside is the removal process can make the water slightly acidic (like naturally soft water). This can sometimes take a few weeks to get used to if you have been drinking hard water all of your life! On the upside, it makes very good cups of tea and coffee. In fact, most high street coffee shops use this for their hot drinks. Some filters in this category do not use scale removal, but employ scale inhibition to help keep your kettle clean. These filters (such as the Pentek 10” TSGAC) use a phosphate-based chemical to pre-react with the hardness in an attempt to stop the formation of limescale. The water will generally taste more like the water from a carbon filter, but won’t usually give as good of a performance in preventing limescale as a genuine scale removal cartridge. These systems remove all of the dissolved impurities from water, leaving just pure H2O behind. The two main product types available are reverse osmosis purifiers and water distillers. Water distillers work by heating up the water to around boiling point, and then condensing the water vapour in a receiver. The dissolved impurities stay in the heating vessel to be emptied out once finished. RO systems use mains water pressure to force the water through a semi-permeable membrane, which allows the water molecules to pass through while keeping the dissolved contaminants behind to be flushed away. Water quality from each of these systems will be broadly similar and a distiller is generally a “counter top” system. Meanwhile an RO tends to be a permanently installed, automatic system which usually needs less looking after. Total Soft Water do not sell water distillers so all information provided from here will relate to RO systems. This water will be chemically very similar to naturally soft water. It will have a clean, fresh taste which makes excellent tea and coffee or a drink in its own right. 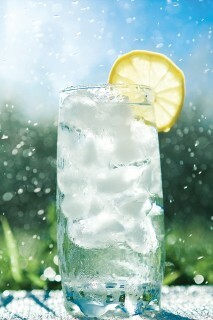 Again, due to its purity, some people used to drinking hard water may take a week or two to get used to the taste. Those people concerned with removing all of the calcium and magnesium from their water can use a re-mineralisation cartridge to put back in some of the “good minerals” while the system has removed the undesirable impurities. However, you will need to check the specific system as not all units offer this facility. So which is best? Come and have a taste and find out for yourself! Visit our YouTube channel for more videos relating to our drinking water filters.